In 1982 the author of this book, an English nurse and midwife, arrived in an Indian shanty town to help establish a medical project. She was a Buddhist whose teacher had worked at the heart of the mass-conversion movement, when millions of “untouchable” Hindus turned to Buddhism. 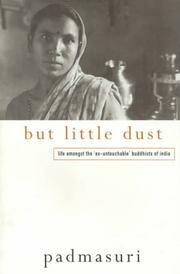 Padmasuri’s response to what she saw was to give up nursing in favour of teaching Buddhism, and in this book she charts her progress as she helps her friends discover dignity, strength and freedom on the Buddhist path of individual and social transformation.